Smooth, healthy skin is central to maintaining your appearance and confidence…even more so now that natural beauty and natural makeup looks are trending. The right products can turn dull, blemished, or sagging skin into a fresh, bright, clear face. But with a market so vast, how do you know which products work best? Part 1 ranks this year’s 11 best skincare products in order, and part 2 will go over how they work and answer some FAQs. This “facelift in a box” from Jeunesse has blown up on social media and YouTube, and if you’ve seen one of the before and after videos, you probably know why. The results are pretty incredible, even for people with severe skin conditions. The package comes with dozens of little single-use vials filled with a formula that you use daily under your eyes or on your entire face. It corrects sagging skin, puffiness, wrinkles, and enlarged pores. Results are almost immediate – it takes 2 minutes to see the difference, and the effect lasts up to 9 hours. Additionally, sodium silicate is used in the formula to adjust your skin’s pH levels, minimizing pores and tightening skin similar to the way a toner does. There’s really nothing else on the market like Instantly Ageless. If Proactiv was one of the most effective skincare regimens of the early 2000s, Rodan + Fields’s skincare regimens are the most effective in 2019. That comes as no surprise, since they were created by the same dermatologists. 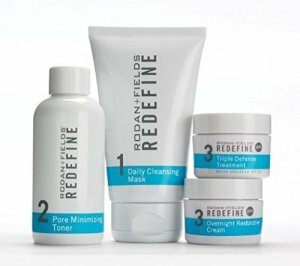 They have several different skincare lines, but the Redefine line specifically targets lines, pores, and loss of firmness. It’s a three-step process that starts with a cleansing mask, then a pore minimizing toner, and finally a reparative moisturizer – one for the evening, and another one for the morning. Finally, the morning moisturizer incorporates 30 SPF to protect your skin from sun damage. It contains clinically tested peptides which help boost your skin’s collagen production, making you appear younger. The overnight moisturizer is heavier and uses hyaluronic acid and glycerin to fight wrinkles and improve elasticity while you sleep. Lilyana Naturals are organic and delicate, great for people with allergies or sensitive skin. 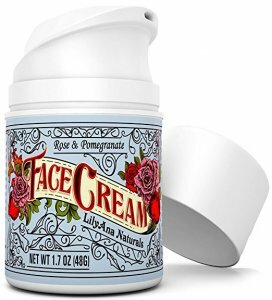 Their Rose and Pomegranate Face Cream Moisturizer hydrates skin, but it also has anti-aging properties. It’s safe for use on all skin types, whether oily, dry, or combination. Herbal ingredients are the star in this cream, which features medicinal plants like aloe vera, rose, coconut oil, and orange extract as well as vitamin C and vitamin E.
Rose is also becoming a popular hydrating ingredient for its ability to clarify and balance skin tone. Its low pH of 5.5 soothes skin, reduces irritation, and makes rose a natural toner. 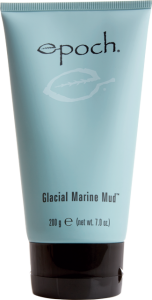 Nu Skin’s Epoch Glacial Marine Mud is all over YouTube with beauty bloggers showing off before and afters of how much this renewing mask can actually improve your skin. The answer? A lot. Packed with over 50 beneficial minerals and trace elements, this mud mask exfoliates dead skin, removes toxins and bacteria from your pores, and rejuvenates damaged or aging skin. It relies heavily on sea botanicals such as sea salt and a special breed of red algae. Sea salt is a powerful exfoliant with anti-bacterial properties. Studies have shown that it creates a thicker barrier on your skin to protect from toxins while greatly improving elasticity. Algae is even more powerful. Skin damage is caused by oxidation, and algae prevents oxidation. It’s also packed with nutrients and great for hydrating dry skin. 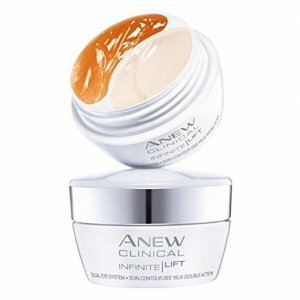 Part of their royalty skincare line, this face cream is an all-purpose moisturizer meant for all types of skin. The main ingredient is squalane oil, which is actually already a natural component of the human skin. However, as your skin becomes dry over time due to aging or weather, it loses many of its natural oils. This product does not contain SPF, so it will not protect your skin from sun damage. 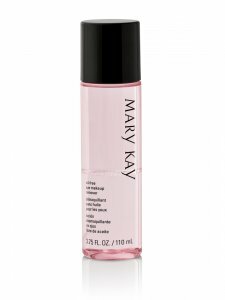 A Mary Kay classic, this product is not just your regular old makeup remover. First of all, it’s oil-free. This is important because a lot of the oils found in cosmetic products can actually trap bacteria and dead skin cells in your pores. In this case, washing your face actually makes it dirtier. This makeup remover is also one of the best on the market for sensitive skin. It’s been clinically tested for skin irritants and allergens and contains no ingredients that can harm the eyes. Also, because it removes all types of makeup so quickly and effectively, the process of removing your makeup with this cleanser is gentle and easy, preventing you from rubbing your skin to the point of irritation. You won’t end up with black under eye circles, red skin, or oily pores after using this lightweight, effective makeup remover. Mary Kay’s TimeWise product line is an easy favorite, and first among them is their Firming Eye Cream. In order to improve firmness, brighten, and smooth the skin around the eyes, this cream uses an ophthalmologist-tested formula that’s comprised of botanical extracts. The active ingredient here is a collagen-enhancing peptide duo, which boosts collagen production. This is almost immediately effective, as the number one cause of wrinkles, sagging skin, and age spots is a decline in collagen production. Baebody went Amazon viral this year, and this is easily one of their most popular products. 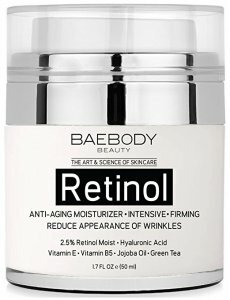 This retinol moisturizer provides deep hydration coupled with anti-aging ingredients that both firm and reduce the appearance of wrinkles. The Baebody formula is all natural, 71% organic, and cruelty-free. It contains no fillers, parabens, or artificial fragrances. This product has taken Avon’s loyal followers by storm and gained them some new ones thanks to its innovative dual cream/gel system. The cream is applied under the eye while the gel is applied to the eyelid and brow bone to fight signs of aging in the entire area around the eye. The cream/gel produces results in just one week using polymers, which temporarily firm skin. Meanwhile, the glucosamine has long-term anti-inflammatory and smoothing effects and shea butter provides hydration. Forever Living’s Aloe Heat Lotion is a hot/cold lotion that’s pH-balanced. Their unique formula is designed to feel like an in-home massage. It’s recommended for use after a workout, athletic activity, hike, or long day to soothe and relax your muscles. This product is gluten free, fragrance-free, and cruelty-free. 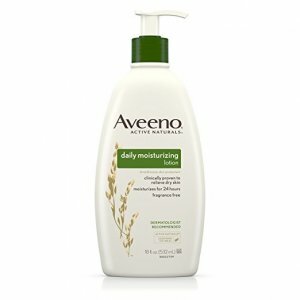 Aveeno’s Daily Moisturizing Lotion for Dry Skin has gained something of a cult following for both its affordability and effectiveness for both men and women with dry and/or sensitive skin. Consistent use over time will build extremely soft skin, however, you’ll notice immediately after applying it for the first time that your skin feels relieved and fully hydrated but not greasy. This lotion is fragrance-free and has a light, non-oily feel so it’s ideal for sensitive skin. Part 2: Why should you use skincare products? What are their benefits and side effects? Healthy skin can make a world of difference for both your appearance and confidence levels. It can also reduce your reliance on cosmetic products designed to cover blemishes and wrinkles, which often clog your pores and make your skin worse in the end. Skincare products for both your body and face have a huge number of benefits. Let’s break some of them down, and then talk about possible side effects. Different skincare products target different problem areas and skin conditions. Cleansers and masks clean out your pores, ridding your skin of toxins and bacteria and fighting acne and blackheads. Exfoliators are a type of cleanser that incorporates small pieces of slightly abrasive materials such as almonds, sea salt, sugar, or oatmeal, which scrub the skin on a deeper level to remove dead skin cells and completely unclogging your pores. Toners are sometimes used after cleansing, especially on the face. These products can be made using natural or synthetic ingredients that are slightly acidic. Their lower pH level balances your skin, evening your complexion and shrinking your pores. Toners are important because most of the products we put on our skin have a high pH level and throw our skin’s pH off balance, causing redness and acne. Moisturizers are hugely beneficial for all skin types. A good lotion can protect sensitive skin and soften it while evening skin tone and re-hydrating skin. Even if you don’t have naturally dry skin, moisturizing your body after showing is important because hot water and soap both strip your skin of its natural oils. People with oily skin and acne often stay away from facial moisturizers, but actually, excess oil production is usually triggered by dry skin. When your skin isn’t properly moisturized, sometimes it will overcompensate by producing too much oil. Keeping your face hydrated will rebalance that. Just make sure you use a high-quality moisturizer that’s good for your skin type. Some skincare lines target more serious skin conditions, such as moderate to severe acne, rosacea, and eczema. Some are over-the-counter while others are prescription only. Anti-aging products are some of the most popular in skincare, and not just for old folks. In fact, it’s often recommended that you start using them in your 20s as a preventative measure. Starting early on will protect your skin and keep it youthful, so when you are older, you’ll have fewer wrinkles and more elasticity. Most anti-aging products help reduce the appearance of wrinkles and fine lines while lifting and tightening the skin and providing deep hydration, as the skin tends to lose even more moisture with age. Many also target discoloration and tone issue, such as dark under eye circles and age spots. Using a daily skincare product with SPF, whether it’s in your moisturizer or makeup, is one of the best ways to protect against signs of aging. Sun damage is the number one cause of most signs of aging, including wrinkles, age spots, thin skin, and sagging or loose skin. While there are no serious side effects of skincare products, it’s important to choose wisely, as some products can end up exacerbating the very problem they aim to solve. Low-quality skincare products that use harmful chemicals tend to produce results in the short-run while stripping your skin of its natural oils and protective layers, clogging your pores, and irritating your skin so that, after a while, your skin will actually appear worse. They can also disrupt your skin’s pH levels and your body’s hormone levels. This is especially important when selecting facial skincare products as the skin on our faces is particularly sensitive and prone to damage. Harmful ingredients and chemicals to avoid in skincare products include parabens, synthetic colors, fragrances, sulfates, preservatives such as formaldehyde, butylated hydroxyanisole (BHA), and PEGs (polyethylene glycol). Usage depends on the product. It’s important not to overuse cleansers and soaps as they strip our skin of its natural oils. Acne products containing strong ingredients such as benzoyl peroxide and salicylic acid are highly effective but should be applied sparingly, as these ingredients can be harsh on the skin. What are the best natural products for your skin? There are many herbal and natural ingredients that can benefit your skin. Some of the most effective include coconut oil, aloe vera, tea tree oil, apple cider vinegar, sea salt, avocado, seaweed, rose, and mud that’s high in minerals and sulfur. Why is it better to use natural products? There are some synthetic ingredients that don’t harm the skin, but many of them strip your skin of its protectants and clog your pores. Fillers, artificial colors, fragrances, and preservatives serve to make your product last longer and smell better, but they don’t benefit your skin and can in fact harm it. How do I hydrate my skin overnight? A moisturizer meant for night use is ideal for making sure your skin stays hydrated while you sleep. Night moisturizers are typically heavier. You can also consider using a humidifier. What is organic skincare? Organic skin products are derived from naturally occurring ingredients such as plants, fruits, herbs, seeds, and natural oils. They are grown without the use of pesticides, herbicides, and other potentially harmful chemicals. How do you keep your skin moisturized? Washing your skin in lukewarm water instead of hot water can prevent it from stripping your skin of its natural oils. Always moisturize your skin after showering, especially if in hot water, and after using any type of cleanser or soap. Make sure you stay properly hydrated by drinking enough water. If you live in a dry climate, consider using a humidifier. Can I use coconut oil as a moisturizer on my face? Coconut oil can be a very effective moisturizer as well as an anti-bacterial. However, if you’re prone to acne or oily skin, you may want to consider a moisturizer that’s specifically designed for your skin type. Why do I have so many clogged pores? All kinds of products and particles in your environment can clog your skin, from oil and dirt to random debris and even your own dead skin cells. Clogged pores can lead to inflamed skin, blackheads, whiteheads, and acne. Hormonal conditions can also inflame the skin and clog the pores. How do I get a clear face? Implementing a daily skincare regimen that works for your skin type is crucial. Don’t ever pop your pimples, and try not to touch your face in general as your hands can transfer bacteria to your pores. Use water-based products, wash your face twice a day, and be disciplined about moisturizing regularly. Proper skincare can completely turn your skin around. It can also maintain healthy skin and prevent signs of aging, acne, and other skin conditions. There are plenty of options out there for skincare products for all skin types. The most important things is to do your research and select products that contain natural, beneficial ingredients that prevent rather than cause skin damage. For MLMCompanies.org #1 skincare product recommendation, click here.